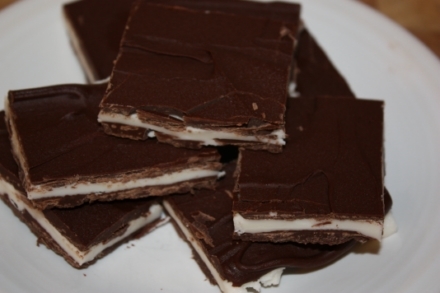 These homemade peppermint patties have been a family favorite for years. This basic recipe came from a Taste of Home magazine from 1995. Yes, these are so good that I have made them almost every Christmas for fifteen years. The original recipe for these had you making individual little patties and dipping each one. My sisters and I have found though that it is much easier to make these into bars. If you like the mint patties that you find in the candy aisle, you will love these. In a large bowl, combine the first four ingredients. Add milk and mix well. Melt 1 cup chocolate chips and 1 tablespoon of shortening in the microwave stirring every 30 seconds until melted. Spread over chilled mint mixture and chill until chocolate is set. Flip bars over and carefully peel or parchment paper. Melt remaining chocolate and shortening and spread over the mint layer. Chill until set. After firm, bring to room temperature and then cut them. If the chocolate is solid these will be hard to cut. I bring them to room temperature to cut them, and then put them back in the refrigerator to store them. I’ve made these since they appeared in the magazine, too. They are certainly a family favorite. I am also making them for a company Christmas party in a couple of weeks! Can’t wait to try these! They sound so good and I just picked up some peppermint extract for peppermint bark! I can’t wait to try these! They look delicious! One more thing, I read to use peppermint oil instead of extract for more intense flavor that is closer to pepp. patties you buy in the store. Have you tried the oil before? If so, what were your results….thanks! @Julie H, I have never used peppermint oil, but I am guessing it would give it a more intense peppermint flavor, I think though that you would have to be careful not to over do the peppermint because I think the oil could easily be over powering. If you try the oil I would make the filling and just use a very small amount, taste, and adjust if needed. I hope that helps. Yay! These look so good…and gluten free too! YUM! @Amanda @ A Few Short Cuts, Yes they are gluten free. I love it when family favorites that I have made for years are gluten free. They don’t need any adapting and those are the best recipes. What do you think would happen if you left out the shortening? I don’t usually buy shortening and would rather not for 2 tablespoons. @Kristen, I like to put it in to help thin the chocolate, but you should be able to leave it out or use a different kind of fat. Basically just melt the chocolate like you do any other chocolate and it should work. I was wondering the same as Kristen. Do you think that you could use butter instead? This recipe looks wonderful. I use chocolate mint candies on top of chocolate cakebox cookies. Now I can make my own! @Darleen, Butter should work fine also because the point is to thin the chocolate a little. You could also just leave it out, your chocolate just won’t be quite as thin for spreading. Will be making these this week. Thanks for posting, they look wonderful. Peppermint patties are one of my favorites. I have made this exact recipe for years. We love it. I will have to try it your way though with the cookie sheet. What a great idea. can only find mint extract at my store-bet that’s different from peppermint extract, huh? @Kelly Perry, Mint extract should work fine. I just made my these! Thank you for the recipe! I actually made the peppermint filling green and red for Christmas. 🙂 So yummy!!! @arminda, I am so glad that you enjoyed them. I am making some today for a Christmas party later this week. I love peppermint patties! I can’t wait to give these a try. I clipped that original recipe from Taste of Home years ago and tried to make them. What a mess! They sure tasted good though! I love the idea of making them into little bars! I can’t wait to try them again! I recently made brownies with a peppermint filling and they were good. Makes me want to try something closer to the real thing! Must try this. Can’t wait to make these! Thanks so much for sharing. @Kelly Perry, I am glad that you enjoyed them. These were such a hit at our co-op party this weekend. My husband said they were so much better then what you could buy at the store! Thanks! Now what should I make next? @Tina, I am so glad that you liked them! If you like mounds bars, my homemade version of those are very good. I just finished making these. So easy and yummy!! Thank you!! I usually use a semi sweet, but dark chocolate is also good. I hope you enjoy them.